Make journal entries in the books of consignor and that of consignee. Assuming that all the goods sent have been sold, the consignment account will show at this stage the actual profit or loss made on it. The same is transferred to profit and loss account. Note: The goods sent on consignment account may be closed by a transfer to trading account. 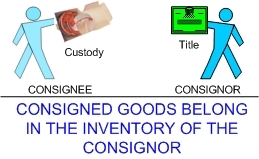 Stock on consignment account is an asset and will be shown in the balance sheet of the consignor. Valuation of stock is discussed on valuation of stock page. No entry is made in the books of account. The consignee is not the owner of the goods and therefore he makes no entry when he receives the goods. The consignor’s account will be closed by debiting it with cash or final bill or draft in settlement. Is the consignor personal account a liability account on the Consignee’s books?